By: Guadalupe A. Velasquez, Assistant Director of the Community Relations Commission and New Americans Initiative Coordinator for the City of Columbus, and Abdikhayr H. Soofe, New Americans Initiative Outreach Coordinator, Community Relations Commission, City of Columbus. The New Americans Initiative of the Community Relations Commission for the City of Columbus visited the Twin Cities from May 23 – 26, 2016. In a collaborative effort to maximize our time in Minneapolis/St. Paul, we joined the Cincinnati Chamber of Commerce delegation to form an Ohio delegation visit that proved to be very impactful and allowed us to leverage our networks to optimum capacity. Our host the Neighborhood Development Center (NDC) scheduled an impressive agenda to provide us with a full scope of how they execute the outstanding neighborhood mission driven strategy that is founded on building from within. 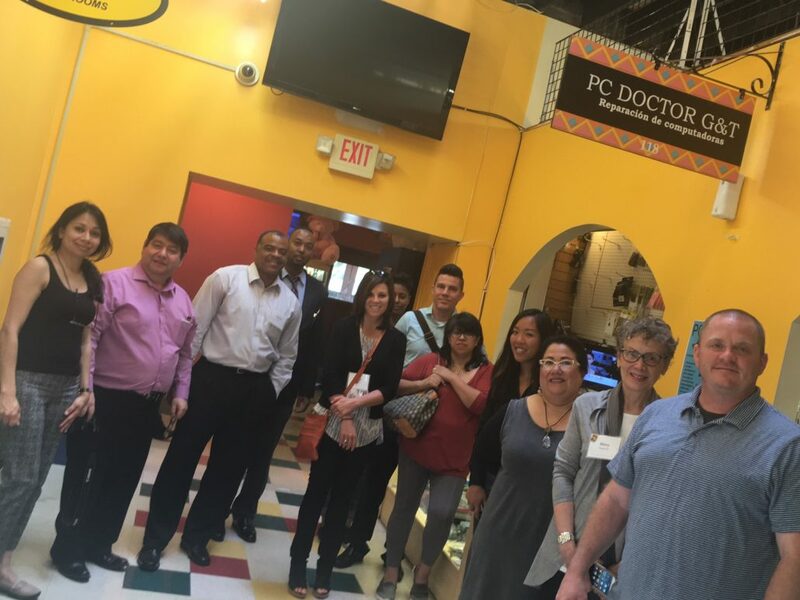 The schedule included an array of site visits and tours along with in depth meetings that included topics such as: Business incubators, access to capital, and how NDC operates by and through relationship building and community outreach, engagement, and advocacy. Throughout these meetings, we learned a great deal about the commitment and focus of NDC’s work and the unique “community focused and driven” model they use when deciding to grant a loan or begin a development project. 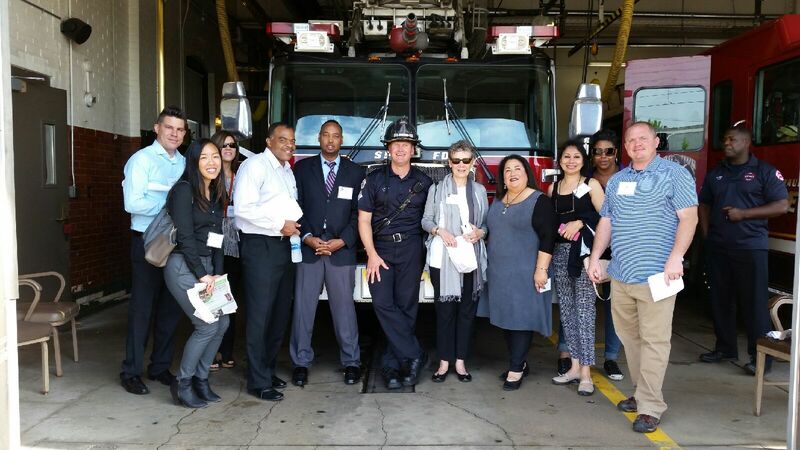 Guadalupe Velasquez and Abdikhayr Soofe, City of Columbus, along with the Cincinnati Chamber of Commerce and partners visit to the Frog Town Fire Department while walking along University Ave. to learn about NDC’s “Neighborhood Improvements Project” in St. Paul, MN. The positive impact NDC makes in their community is admirable and in large part due to a strong team that makes the magic happen. Mihailo Temali, Founder and CEO, is a son of immigrants who understands integration at its core. His entire team of culturally competent staff and board members ensure that long lasting relationships are built on deep understanding and trust. Along with spending time with Mihailo we had the pleasure of meeting and learning from one of the pillars of the NDC team – Isabel Chanslor. She understands clients’ perspectives and is highly experienced in navigating what at times may be complex projects. Isabel is key to the transformational work being done by NDC. NDC’s lending practices, the manner in which they process applications, and the intentional focus on developing relationships with their clients are all elements to their implementation that help them empower and uplift low income families. We found the ongoing training programs to be exceptionally well designed to prepare each individual client for success. NDC not only provides non-traditional grants and technical support, they help sustain their clients through a meaningful, ongoing partnership, which helps ensure success for both parties. Having a relationship with prospective entrepreneurs as well as existing neighborhood business leaders is key to NDC’s model. Mercado Central – a business incubator that is home to more than 35 small businesses and serves as a cultural and economic hub. In the photo: Guadalupe Velasquez and Abdikhayr Soofe, City of Columbus; Mary Stagaman and Darrin Redus, Cincinnati Chamber and partners; Bryan Wright PhD, Dani Watkins, Alisa Berry, Tessa Xuan, Joe Hansbauer, Raj Narang and Isabel Chanslor, NDC. Through our discussions with Mihailo, Isabel, department directors, the chief program officer, and business owners, we left motivated and inspired by the service NDC provides to the community. This newly formed relationship with the NDC team and Cincinnati Chamber enriched our experience, and seeing firsthand NDC’s work and impact affirmed our belief of the importance of intentional relationship building within integration work. Our takeaways confirm that inclusion of many partners across various sectors at all levels of community engagement is critical to overall success. Partnerships with diverse leaders can help transform blighted and depressed areas into thriving neighborhoods that serve as a community cornerstone. We appreciate the effort, time, and attention given to us by the NDC staff and business community. The connections we made were invaluable and will be sustaining. We look forward to sharing what we learned with city, county and community leaders in Central Ohio and to implementing some new ideas such as a Global Marketa. We would like to thank Mary Stagaman of the Cincinnati Chamber of Commerce for inviting us on this visit as a collaborative Ohio delegation. Engaging NDC in tandem with representatives from Cincinnati gave us the opportunity to meet and learn from our peers in Ohio and develop relationships that will foster the sharing of strategies and successes, and help propel our work forward. We would also like to thank the WE Global Network and Welcoming America for creating an outstanding opportunity to learn and share best practices through the City-to-City Visit.